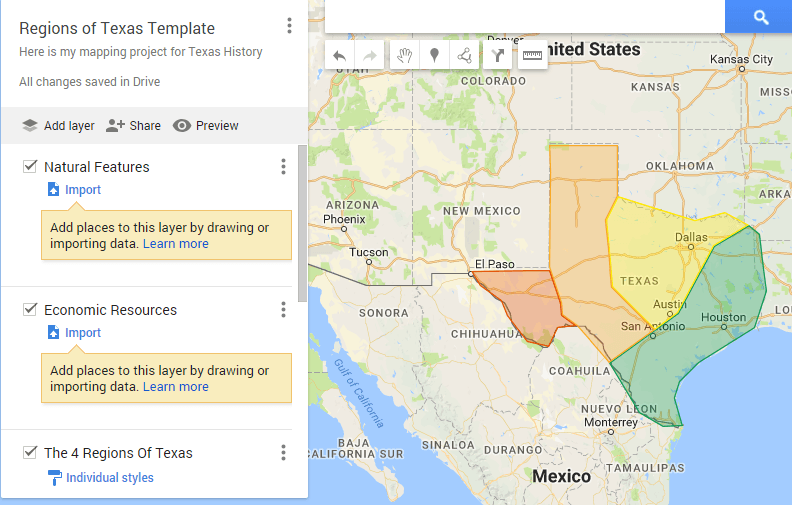 Description: Students will create a Google My Map with the four regions of Texas outlined. Students will add layers to this map for natural landforms, climate, economic resources, and population. Technology TEK: (3) Research and information fluency. The student acquires and evaluates digital content. The student is expected to: (A) use search strategies to access information to guide inquiry; (B) use research skills to build a knowledge base regarding a topic, task, or assignment; and (C) evaluate the usefulness of acquired digital content. (4) Critical thinking, problem solving, and decision making. The student applies critical-thinking skills to solve problems, guide research, and evaluate projects using digital tools and resources. The student is expected to: (A) identify what is known and unknown and what needs to be known regarding a problem and explain the steps to solve the problem; (B) evaluate the appropriateness of a digital tool to achieve the desired product; (C) evaluate products prior to final submission; and (D) collect, analyze, and represent data using tools such as word processing, spreadsheets, graphic organizers, charts, multimedia, simulations, models, and programming languages.